[Note: The presentations, a detailed meeting report and other relevant links are at the end of this article]. 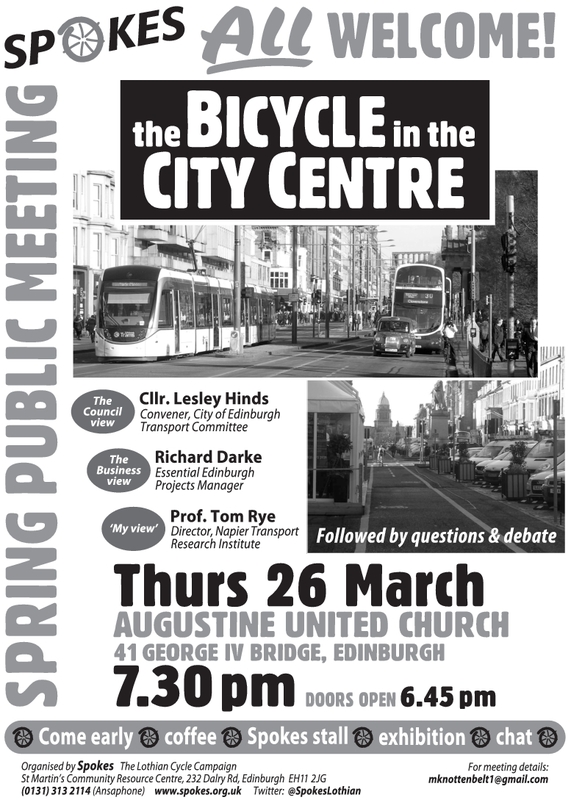 The presentations and discussion ranged wider than just Edinburgh City Centre cycling, into issues including pedestrianisation of city centres, disabled access, the work of international architect and occasional Council adviser Jan Gehl, and the role of buses and trams. 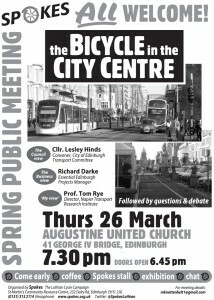 Perhaps the most significant moment of the night for Spokes was Cllr Hinds’s affirmation, almost in passing, that the Council intends to continue its policy, during this term of office, of raising the cycling budget as a % of transport capital and revenue spending from 5% by 1% each year, reaching 10% in the final year before the next elections. This is the first time we remember seeing the 10% figure in writing and publicly stated. Admittedly, decisions are renewed each year at budget time, so nothing is guaranteed, but, provided councillors continue to believe that the policy is welcomed and is succeeding, then it seems likely to continue. Of course – cycle cash does impact heavily on the city centre, since the Council will not be able to win the hefty Sustrans/government cash it needs for projects like the east-west segregated cycleroute unless it makes its own substantial contribution. 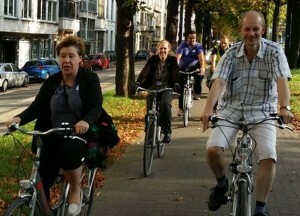 Cycling in Ghent: confidence grows! 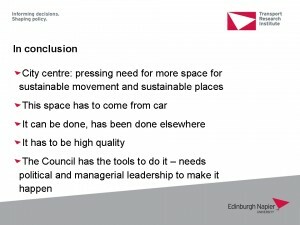 Cllr Hinds won over the audience right away by recalling her promise of getting herself cycling in Edinburgh, and outlining her 3-step plan to acheive this. 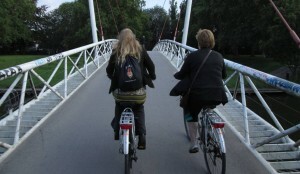 After not using a bike for many years, she had at last ventured on one during a 2014 investigation of Ghent‘s transport system. Step 2 comes soon on a visit to Copenhagen. Step 3 was decided by fate, thanks to a recent raffle ticket which has won her a Bike Station cycle training course!! Since 2013, when the BID re-launched, footfall and trading are up substantially, and user surveys have shown wide support for extended pedestrianisation. Although there is demand for more car parking from some businesses, and the BID seeks to enhance this, Richard said it was noticeable that there were often spare spaces in nearby streets and even in George Street itself. Many more people now access the city centre by public transport and active travel, and Essential Edinburgh is fully behind improved bike access and parking, as well as maximising public transport use. Essential Edinburgh welcome views and suggestions – Richard can be contacted via the Essential Edinburgh website. 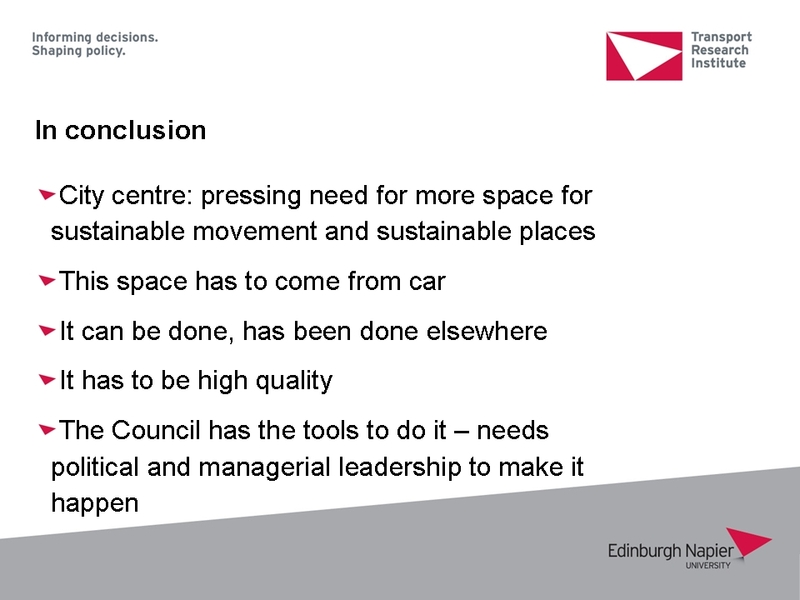 Edinburgh Council’s draft Street Design Guidance is excellent – but it will only be widely and successfully implemented through political and managerial leadership, training, resources and a feeling of ownership.